My opinion on: Deal or No Deal. Aside from the absence of a certain bearded fellow, this is one of those rare and beautiful occasions where the online game is just like the TV show of the same name. If you like the Deal or No Deal TV show, you’re going to love this Deal or No Deal online game. The only real difference about playing the Deal or No Deal game online is that you have to pay to play. But then again, what else would you expect from a good real money game? The potential wins are generally lower if you’re playing for small stakes, but I think we’ll all agree that that’s a fair trade off for not having to listen to Noel Edmonds do a poor job of pretending to get excited for you as you progress through the rounds. To put it simply, Deal or No Deal is an excellent flash game version of the TV show. "Deal or No Deal" for real money is tense, and tense usually = fun unless you have a serious heart condition. Deal or No Deal combines strategy, excitement and tension magically to provide you with an incredibly well-constructed and entertaining online game. For the sake of giving a balanced review, I will say that I wish the game had the opportunity to provide you with a bigger potential wins. The maximum win of 10x your initial stake (if you get lucky) is pretty tame, especially when you compare it to other great TV games like The Money Drop. If you’re after the opportunity for massive wins, you’re not going to find it here. 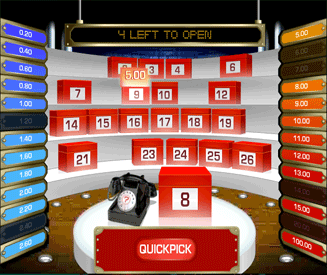 However, if you want to have loads of fun playing games for money online, Deal or No Deal is about as good as it gets. How to play Deal or No Deal. Select how much you want to wager (the more you wager, the more the boxes will be worth). Choose the box you want to keep throughout the game. Eliminate 24 boxes over the course of 5 rounds. 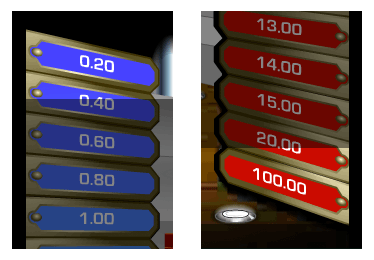 Choose whether or not to take the banker’s offer ("deal" or "no deal") or continue on with the game in between each round. Unless you don’t have the luxury of a TV or you’re consistently fall asleep between the hours of 4 and 6 in the afternoon, you should already know how the game of Deal or No Deal works. The online version of the game plays almost exactly the same way, so you’re probably not going to need to read my explanation of how to play Deal or No Deal online (but I’m going to give it to you anyway). 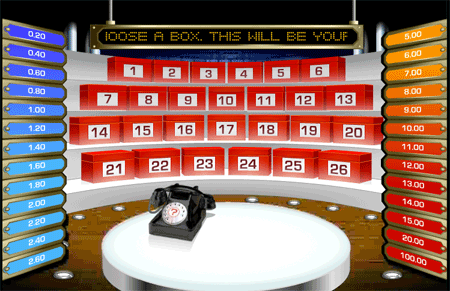 There are 26 boxes in the game of Deal or No Deal. In each of these boxes there is an amount of money that remains unknown until the box has been opened. Fact: The amount of money in each of the boxes is fixed and ranges from 0.02x to 10x your initial wager. At the start of the game you select your box, which you will keep until the end. You then eliminate each of the remaining 25 boxes as you go along. At certain intervals you will be offered money from the "banker" in return for your box as opposed to carrying on with the game and attempting to win a larger amount. The amount of money you are offered from the banker for your box will vary depending on what boxes are left in the game (the more valuable the boxes the better). You can choose to take the banker’s offer, or you can continue to the end and collect however much money your box turns out to be worth. To win the most money from the game, you want to hope that you can keep the high-value boxes in the game for as long as possible. 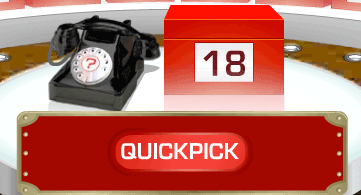 The Deal or No Deal online game follows a very straightforward routine. Choose how much you want to wager in one game. Eliminate between 4 and 6 boxes (the exact number depends on the round). Choose to take the banker up on his offer or play on with the game. Repeat steps 3 to 4 for five rounds. Collect the value of the box you originally chose if you have not taken the banker up on his offer at any point. As I keep saying, it’s just like the TV show. Min payout = 0.02x your stake. Max payout = 10x your stake. The payouts for Deal or No Deal online can vary between any of these two multipliers. The only way to achieve either of these two extremes is to stick with your selected box throughout the entire game. Therefore, the only way to win 10x your initial stake is to get lucky and choose the highest value box at the start of the game out of all the 26 boxes on offer. The banker will offer you various payouts at intervals throughout the game. These payouts can be anywhere between 0.02x and 10x your stake depending on the value of the remaining boxes in the game. To help speed up the game there is a quickpick option available to you. This quickpick option will select and eliminate all of the boxes necessary for the round in question on your behalf. This lowers the excitement of the game a little as the box selection is completely taken out of your hands, which in my opinion is the most fun aspect. However, if you don’t have much faith in your luck then you’re going to find the quickpick feature quite handy and less painful. Playing Deal or No Deal online is more about judgment than it is strategy. The banker usually offers an amount of money that is smack-bang in the middle of the collective value of the left-over boxes and doesn’t really offer an overly generous amount at any point. You’ll find that the most valuable box in the game carries a considerable amount of weight. The longer you can keep this box for the better. You will notice that as soon as you lose this box, the offers that you receive from the banker will decrease significantly. Remember that there is a 1 in 26 chance that you pick the maximum value box at the start of the game, so don’t get too carried away and assume that it’s in your possession. I guess I haven’t really covered much in the way of strategy, because how you play the game is entirely up to you and there is nothing you can do to improve the fundamental odds. Just be sure to keep a cool head and don’t regret any decisions you make.